1989. However, she was familiar with the Anglican faith having attended an Anglican primary school and services at the Anglican Church next door with which the school was affiliated. She worked as an office administrator in Hong Kong and Beijing before immigrating to Canada in 1988. She was able to quickly obtain full time secretarial work and attended Toronto’s Seneca College to obtain an executive secretarial diploma. Upon receiving God’s calling, she completed the Masters of Divinity in Pastoral studies from Tyndale Seminary. And then served as a pastor at Church and a Chaplain in hospice. 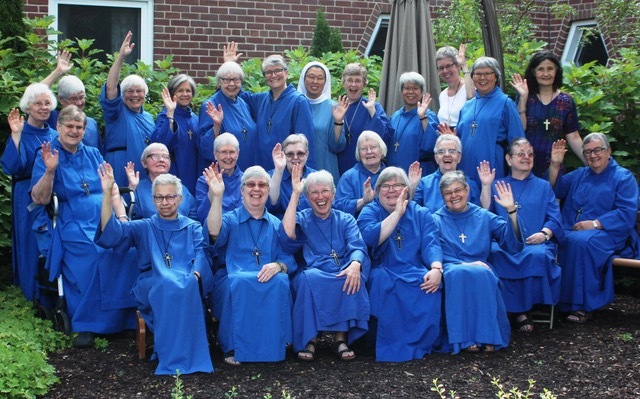 Sr. Dorothy Grace retired in 2013, and asked God what was next in her life. She attended the SSJD Women at a Crossroads program in the summer of 2014 at the urging of a friend. She had always been attracted to the religious life, having been initially inspired by the Sound of Music movie. She joined the SSJD community as an Alongsider in the fall of 2014, and was assigned to the spiritual care team at St. John’s Rehab Hospital (SJR) for her year in the program. She acknowledged that she learned a lot about life from her pastoral and spiritual care work, and that those patients were a great source of encouragement and inspiration for her. During a 40 day retreat at Loyola House in the late fall of 2015, Sr. Dorothy Grace confirmed that formally entering the SSJD community was the place where she should go to build a deeper relationship with God. This community also seemed to be the right place to share the gifts God had given her, and to explore what further gifts she might discover and offer. She joined the SSJD community in January 2016 adding “Grace” to her given name in acknowledgement of the Grace of God in her life. Initially assigned to Chapel duties, she is finding that this is a wonderful and exciting new beginning for her.